Posted on April 13, 2017 by Emily Allbon. Being part of City’s ELMC team this year has been an exciting experience. We started out back in November, when Ben Lewy, Miguel Rodriguez, Doug Grant and I were selected to represent City at the ELMC. We had a month or so to study the lengthy moot problem, which was split in two parts – the first focusing on more traditional EU constitutional questions and the second on the legality of the Single Resolution Mechanism and the powers of the European Central Bank. By the end of November we submitted written pleadings (Phase 1 of the competition). Niall celebrates with the team! In the New Year found out that we had passed Phase 1 and would be mooting in the Regional Finals in Paris. Each one of us had a specific role: Appellant, Defendant, Advocate-General or Legal Counsel. The first three plead and legal counsel assists while they speak by having at hand any case-law or legislation which might be needed to respond to judicial interventions. Preparing for the moot is therefore inevitably quite a group effort – as legal counsel has to liaise closely with the other three. We had the benefit of a great and committed coach – Niall Coghlan, Graduate of the GDL and BPTC at City. He led our meetings, focused our submissions, drilled us on our knowledge of EU law and helped us improve our mooting style. We really couldn’t have made it without him! I was unable to attend the Paris Regionals due to a BPTC exam, but Ben, Doug and Miguel were impressive and managed to win all rounds of the two day mooting and so win the Paris round. 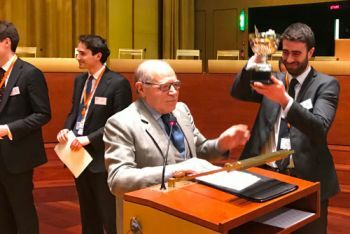 We were then to compete at the CJEU in Luxembourg against the victorious teams of the three other Regional Finals (this year held in Naples, Gothenburg and The Hague) in the all-European Finals. 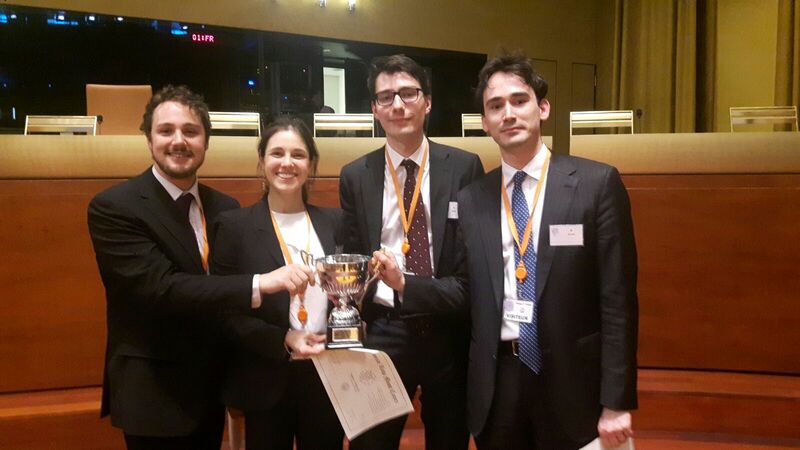 During the time between the Regionals and the Luxembourg Finals we met two or three times a week to deepen our understanding of the case and improve our pleadings. 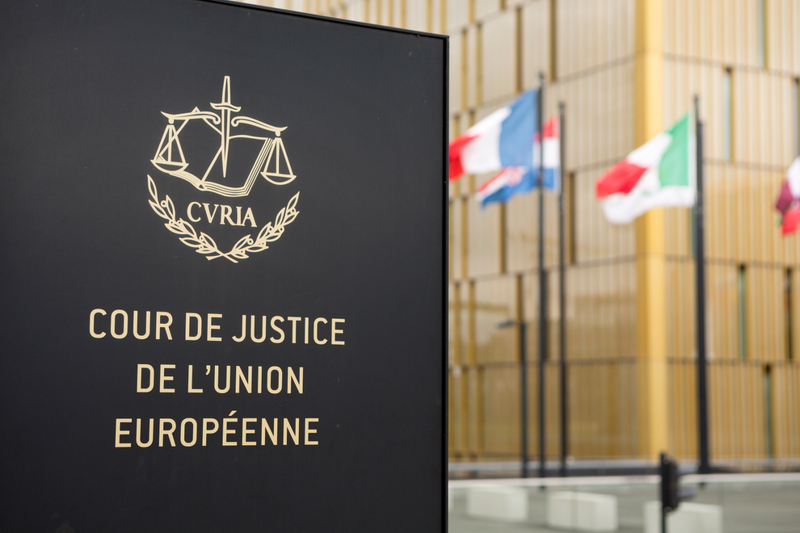 By the time we got to Luxembourg, we knew EU law inside out, and had prepared responses to what we thought were all the questions that could be asked by the judges. This preparation period was intense, especially as it happened at the worst time of year (pupillage interview time) but it was ultimately worth it. In Luxembourg Ben was Applicant, I was Defendant and Doug and Miguel Legal Counsel. I was to plead in the first moot against Maasstricht University, and if I got through Ben would plead in the second, and final, moot. On Thursday morning we met the other teams, were given a tour of the Court and attended a hearing. We then spent the afternoon and evening practicing. As far as I am concerned, having the team there to listen to my pleadings, polish my French, help me convey my ideas simply and persuasively, and to build the confidence I needed to moot before the Judges and Advocates-General of the Court was crucial. It was greatly thanks to them that I got through on the Friday morning, giving Ben the chance to moot against Lund University in the afternoon. Ben’s strong, charismatic advocacy, his quick-thinking and his capacity to engage in constructive discussions with the Judges brought us to victory. I think I can say on behalf of all of us that we deeply enjoyed being challenged by the difficult interventions of the Judges and Advocates-General who listened to our pleadings, that we found the moot problem stimulating, topical and challenging, and that we ultimately had a lot of fun preparing for this moot together. The issues of EU law that we had to discuss were very complex, interesting and unresolved and therefore gave us the chance to be creative and provocative in our arguments. Mooting before the CJEU, before key members of its judiciary, is also a unique and incredibly exciting experience. Meeting students from all over the world and spending time with them in Luxembourg was equally enriching. I would highly recommend the ELMC to anyone thinking of participating next year. Finally, we are grateful to Niall for having coached us so thoroughly, and for having invested so much in the moot. We also send a big thank you to Professor Panos Koutrakos, Emily Allbon, Sir Alan Dashwood and everyone at City who supported us along the way and who made this happen.